Target Audience: 21 - 40 y/o working professionals who are compulsive phone checkers. Our target users are working professionals who find themselves compulsively checking their mobile devices, regardless of what situations they are in. They may or may not even be aware of how frequently they engage with their technology and how their behavior impacts their personal relationships and quality of life. We originally hypothesized that a large percentage of our respondents would view their device usage as problematic, we learnt that the majority of the respondents showed low concern about their habit and were reluctant to change. However, participants indicated being bothered by others’ device usage in social situations. We also learned our participants' device usage in social situations depends heavily on the behavior of others around them and on perceived social conventions. Therefore, we needed to create a solution that would not only help people's own compulsive device checking, but would also alter other peoples’ device usage in social situations. 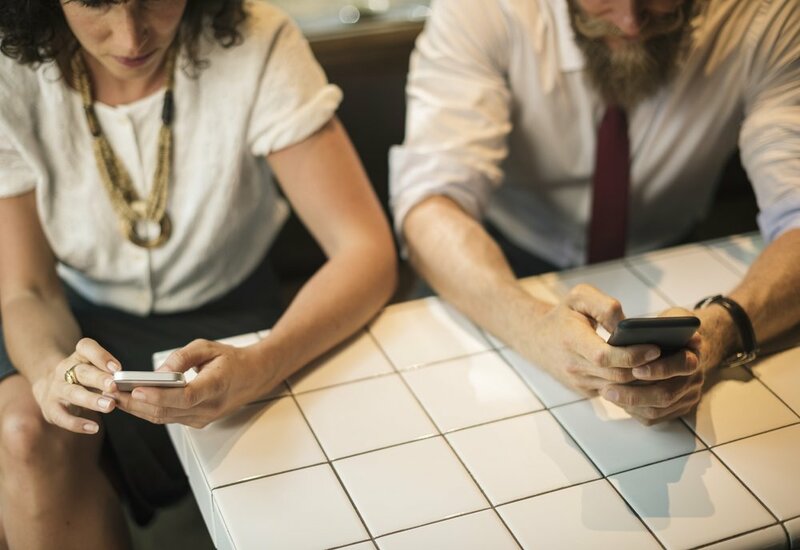 A drastic increase in the usage of mobile devices, which offer continuous access to entertainment and socialization functions, has made it harder than ever for people to disconnect from their phones. This in turn made it a challenge to connect with each other in real life. 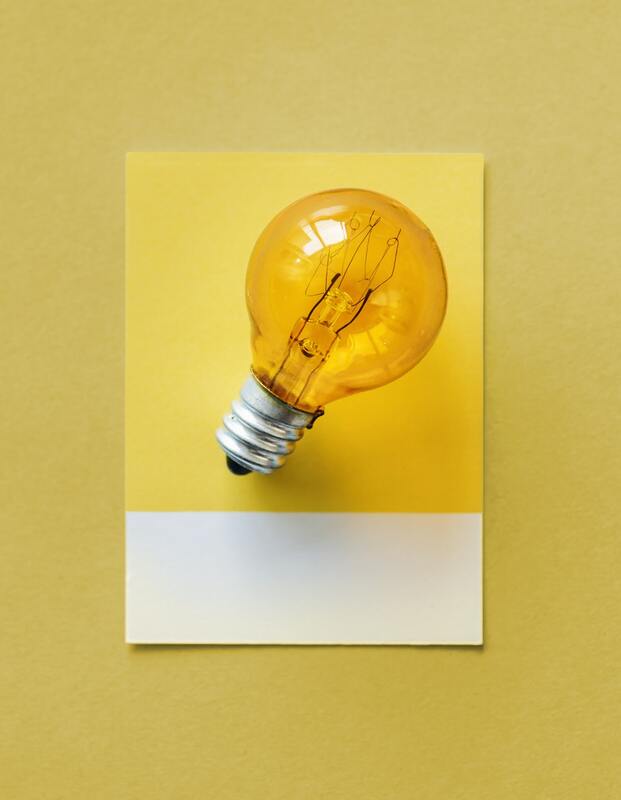 Being an increasingly prevalent social problem, we set out to explore various design approaches in an attempt to help remedy these bad habits. Design Question: How might we help compulsive device-checkers put down their distractions and engage with others around them? Next we conducted a general survey and a few in-depth interviews with pre-screened participants. The survey resulted in 67 total responses which helped us collect basic demographic information about our potential user groups and general patterns. We followed up by conducting a total of 9 semi-structured interviews with working professionals aged between 24 and 41 years, both over the phone and in-person. We recorded all responses in a spreadsheet and cross-compared answers across participants. The idea was to enable users track their mindfulness and engagement with others with the help of a smart wearable wristband that would be tracking their actions. The band would be paired with the disTrackted mobile application which would serve as the interface that users interact with to check the progress they've made. To add a social element to this and make it more motivational we decided to add a gamification aspect, where users can share and compare their progress. After wearing the wristband for a certain period of time, the device would eventually be able to recognize the users' hand gestures and movements in situations where they are talking to someone or using their phone in the presence of other people, which would translate into "low charge" color (low saturation) on the wristband. 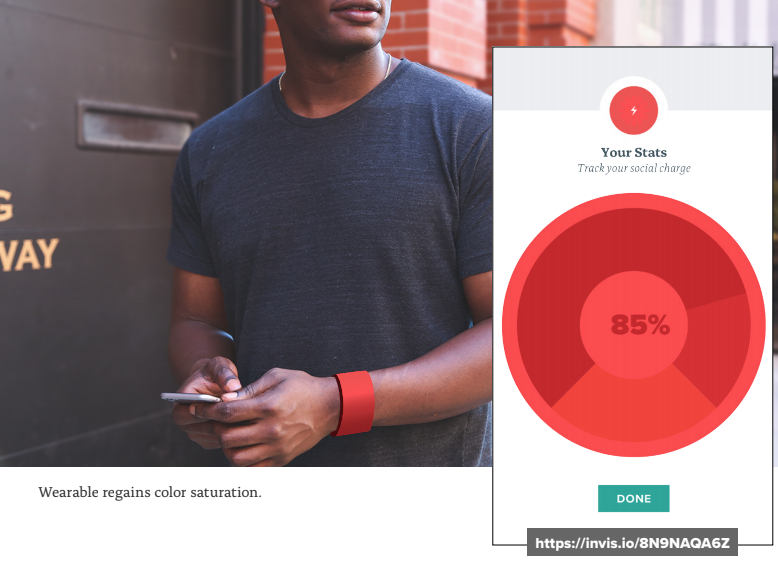 As the user resists the distractions and does not use their phone while in a real-life conversation, the wristband regains social charge and becomes more saturated in color. In the images to the right, we use an example of a grey wristband turning saturated red as the user turns away from his phone and engages in a conversation with a stranger, thus letting his wristband gain more "social charge". This is my original drawing of a wearable that "senses" situations when a user may be socially engaged and mutes distractions (notifications and messages) from pre-selected apps and people. The biggest challenge for us was to design an app and wearable that would be simple to use but not engaging to the point they became distracting. To solved that, we explored the idea of creating an application that encourages users to engage with those around them without constantly prompting them, without flashy UI and addictive fun features. 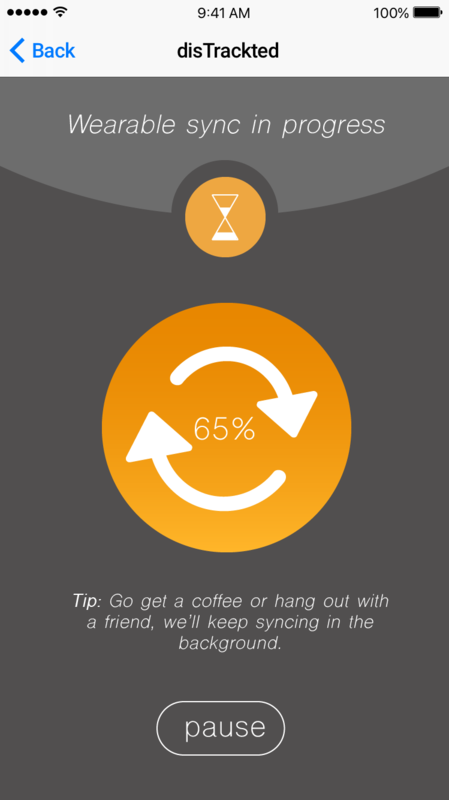 If we were given more time, we would add another syncing feature, where the app would sync with the user's calendar and reminders so that it knows intuitively when the user will be in a social situation and needs to avoid distractions. Click on the image below to check out our final presentation deck. We used this low-fi prototype where the task was to pair their wearable device with the phone and start the body-movement sync. Other tasks included syncing their calendar with the app to keep it updated with the upcoming social events, create a profile and mute notifications from other applications. We followed a script for all the user tests and conducted pre-test and post-test interviews to gather their thoughts on the band and gamification. After testing the lo-fi prototype, we refined the prototype to improve it according to user feedback and our observation.